Anki Overdrive is toy car racing like you have never seen it before. Taking the best of racing computer games and combining it with a remote controlled toy car, Anki Overdrive allows you to race your supercars using your smartphone! Not only that, but this is no ordinary race. Use your weapons to blast the opposition and speed your way to victory! With a variety of game modes, including head to head battles, the ways to play with Anki Overdrive are beyond imagination. The better you race, the more you can upgrade your car. This is not just a new toy; this is a new genre of toy. Is the Anki Overdrive Starter Kit Worth Buying? 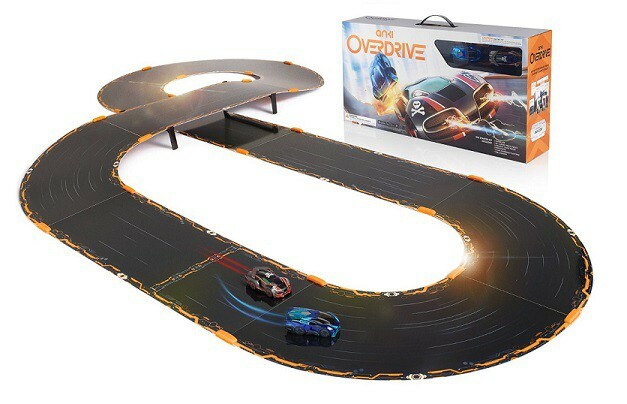 The concept for Anki Overdrive is actually quite simple – it’s the execution that takes your breath away. Put simply, you are racing toy cars around a magnetic track, but instead of using a remote control, you are using your smartphone and an app. However, the real genius of Anki Overdrive is not just that your phone is now your controller, but of how much more functionality this provides you with. Each car has its own character and its own features, much like with a computer game. Similarly, each car has its own special weapon that can be fired at the opponent. Again, these weapons can be upgraded over time. With many different types of play, the possibilities here are endless. Keep in mind – this is just a starter pack, with two distinct supercars. What Anki hope, and what your children will want, is that you build your collection further. Extra track pieces can be added for even more fantastical racetracks, while additional cars will only make for more mayhem and more fun. Think of Anki Overdrive as a real life version of Mario Kart, and you will be some way towards appreciating just what a fantastic idea this is. Any time you combine racing with weapons, children will flock to it, and this is no different. It has been some time since a toy company has really taken a big step forward with track based remote controlled racing. Anki is doing just that, and there is little doubt that Anki Overdrive represents the RC toy racing of the future. If you can put your hands on this set, do so immediately. You won’t regret it.